Two good things happen when the Christmas holidays end, one, the kids go back to school leaving their selection boxes unattended and two, Easter Eggs appear in the shops. If you fall prey to chocolate related guilt then Cadbury Mini Eggs are ones for you. The bright packaging is void of any chocolatey pictures, therefore you are quite justified in claiming you believed the pack to contain simply eggs, and we all need protein, right? Need an extra guilt squasher? Blame it on the product placement designed to make shoppers impulse buy. Mini eggs are usually found near the checkouts in the supermarket or on the counter in smaller shops so it’s hardly your fault that you automatically purchased one or two packs is it? The two packs I have in front of me (for research purposes obviously) are the 100g pack; a bit difficult to open without tearing, but I just rip it and empty them in a dish (you cannot risk these eggs falling to the floor) and the plastic tube with a flip lid. I imagine the flip lid is designed to keep any uneaten mini eggs fresh. Did the designers not even try the eggs before wasting their time creating something that simply would never get used? It takes a matter of minutes to consume these eggs therefore once that flip-top has been flipped it will never get a chance to be flopped back down. The best thing about Mini Eggs? The crispy shell has a fine coating of powdery sugar which tempts the tastebuds just prior to the crunch. The shell is the perfect thickness to allow a sublime crunchiness which mixes so well with the solid, yet creamy chocolate. The packaging says to store in a cool dry place but let’s face it, this information is totally irrelevant. I say, have a good cup of coffee with these eggs and feel that chocolate melt as you crunch the sugary shell. Filed under cadbury, easter, eggs, milk chocolate, uk. I like mini creme eggs better. Don’t forget the mini-eggs that are malted….yum. 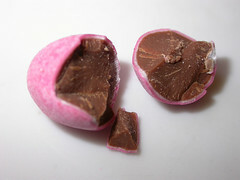 Did you know that you can melt the minieggs for 1 minute in the microwave and have melty chocolate with a crunch shell? Has anyone noticed that they have changed the recipie of the shell. They are much harder, more candy like and not as tasty as they used to be? Yes, taken over by Hershey’s I find them sub par the chocolate is not good either. Not Cadbury quality.